Susan Armington works in painting, mixed media, and imaginative map-making. Her art and community work deal with connecting across difference; and the role of words in bringing us together, as well as maintaining our separateness. Her art makes frequent use of text in various languages as material for constructing 2- and 3-dimensional images. Armington, who holds degrees from Brown University and Cornell University, is a roster artist for the Minnesota State Arts Board and for COMPAS’ Writers and Artists in the Schools Program. She has led art workshops statewide, as well as at the Weisman Art Museum, Minneapolis Institute of Arts, the Minnesota History Center, and Walker Art Center. She directs Talking Suitcases,TM an arts-based process for evoking story and creating powerful dialog around personal and community issues. She also originated the Pictures at an Exhibition project which exhibits new art by 10 Minnesota artists, inspired by music by Mussorgsky that was itself inspired by visual art. 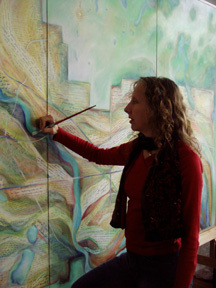 In 2005, she was project director for and exhibited in Prism of Longing, a show of art by Jewish, Arab, and Christian artists at the Phipps Center for the Arts, in Wisconsin. In 2008, she curated and exhibited in “Ordinary/Extraordinary: the Art & Life of Stories” a show about visual story with work by artists from Japan, Russian, Liberia, and the U.S. She was a mentor in the WARM Mentor Program and in the Teaching Artists Program at the College of Visual Arts. Armington grew up on the East Coast, where she studied foreign languages and linguistics, and met her Japanese husband, Yuichi Kubota. After moving to Minneapolis 25 years ago, she lived for 2 and a half years in Japan with her young boys, while she taught at the University of Tsukuba and her husband worked in Minneapolis. Afterwards, she continued her art-making, studying for 2 years in the WARM Mentor program and later at the University of Minnesota and Minneapolis College of Art and Design, and now at MCAD (Minneapolis College of Art and Design). In 2012 she was commissioned to create Dreamcarriers - a set of life-size figures of youth from around the world for installation at the International Labour Organization and United Nations, in Geneva, Switzerland. In 2014 her Talking Suitcases project was invited to be part of Half the Sky an intercultural exhibit and exchange on Social Practice Art in Shengyeng, China. In 2004, Armington received a Minnesota State Arts Board grant to create a map of the Twin Cities out of the words and languages of the people who live here. The painting Geography of Home was on display January -April 30, 2006 at the Weisman Museum of Art at the University of Minnesota, and toured widely in the Twin Cities, including exhibits at the office of Minneapolis Mayor R.T. Rybak, Intermedia Arts, colleges, churches and synagogues, and the Minnesota History Center. In 2009, Armington received a MN State Arts Board grant to develop her series of portraits of diverse people from the Twin Cities made of their own words, stories, and maps. She also received a “Changemaker of the Year” award for Talking Suitcases from the MN Women’s Press, honoring her “impact on the lives of women and children.” In 2013 she was awarded a third MN State Arts Board grant to create River Stories Maps of three MN rivers: the St. Croix, the Lac qui Parle, and the Mississippi. Paintings from this work are in the collections of the Mississippi Watershed Management Organization, the St. Croix Watershed Research Station, and the Lac qui Parle History Museum. Armington has a studio in northeast Minneapolis in the California Building. She can be reached at armington007@gmail.com.